Kuntala Ray will return to Asheville to perform on Indian classical guitar and Hansa Veena (a lap-held, sitar-like version of the slide guitar), accompanied by Chiranjit Mukherjee on tabla, in a free concert at 7 p.m. on Tuesday, Nov. 6 at UNC Asheville’s Highsmith Student Union Grotto. Ray, who hails from a family of musicians and is one of the few female instrumental virtuosos of Indian classical music, last performed in Asheville a decade ago, with shows at the university and at the Flood Gallery. She is a disciple of sitar maestro Pandit Soumitra Lahiri, who played a well-received concert at UNC Asheville’s Lipinsky Auditorium in 2011. Ray has performed across India and for audiences in many parts of the globe. 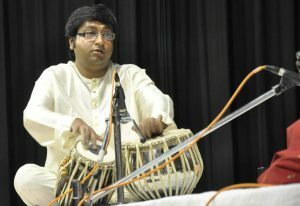 Ray will be joined by Chiranjit Mukherjee on tabla, the India hand drum popularized in the U.S. by Ustad Alla Rakha and his son Ustad Zakir Hussain during Pandit Ravi Shankar’s groundbreaking American concerts. Mukherjee is a disciple of Pandit Kumar Bose, known for his performances in India with Shankar. This concert is sponsored by the university’s National Endowment for the Humanities Distinguished Professorship and by many UNC Asheville programs and departments. For more information contact Keya Maitra, UNC Asheville professor of philosophy and Howerton Distinguished Professor, at kmaitra@unca.edu or 828.251.6365.